There is A LOT of sport in Toronto. 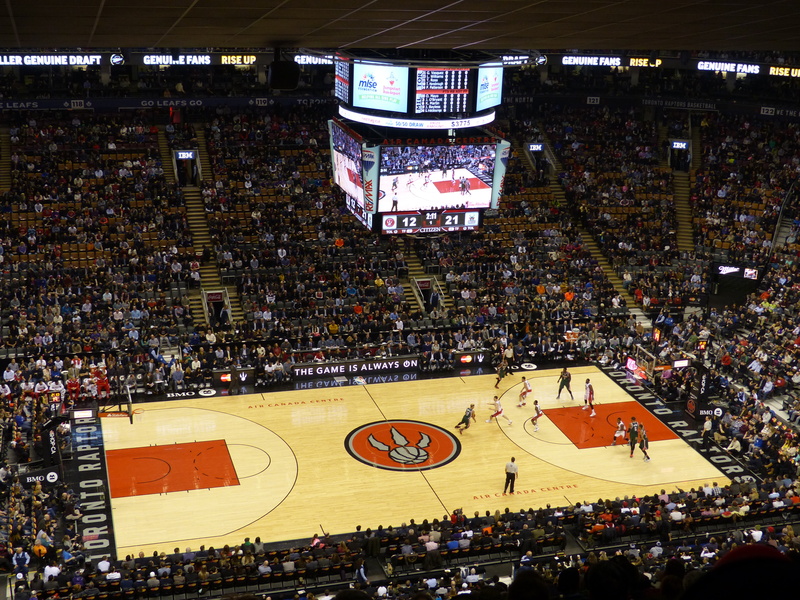 It is home to Canada’s only basketball team in the NBA, the Toronto Raptors; Canada’s only team in Major League Baseball, the Toronto Blue Jays; the Toronto Maple Leafs ice hockey team of the NHL; and one of Canada’s three teams in Major League Soccer, Toronto FC. There is also the Toronto Argonauts of the Canadian Football League (a sport closely related to American Football), the Toronto Rock lacrosse team (lacrosse, not ice hockey, being Canada’s national sport after all) and the Toronto Marlies (a secondary ice hockey team). If that’s not enough, Toronto hosts an Indycar race, which is the American version of Formula 1, and shares hosting duties with Montreal for the Rogers Cup (the Canadian Open), which is one level down from tennis Grand Slams such as Wimbledon. In 2015 the Greater Toronto and Hamilton Area is also hosting the Pan Am and Parapan Am Games – an Olympic and Commonwealth Games style event but just for the Americas. So that’s a lot of sport, and as a sport nut, I hope to see a lot of it! I’m not sure that Emma shares my enthusiasm though. After all, she seems more interested in the shoe museum and local zoos. 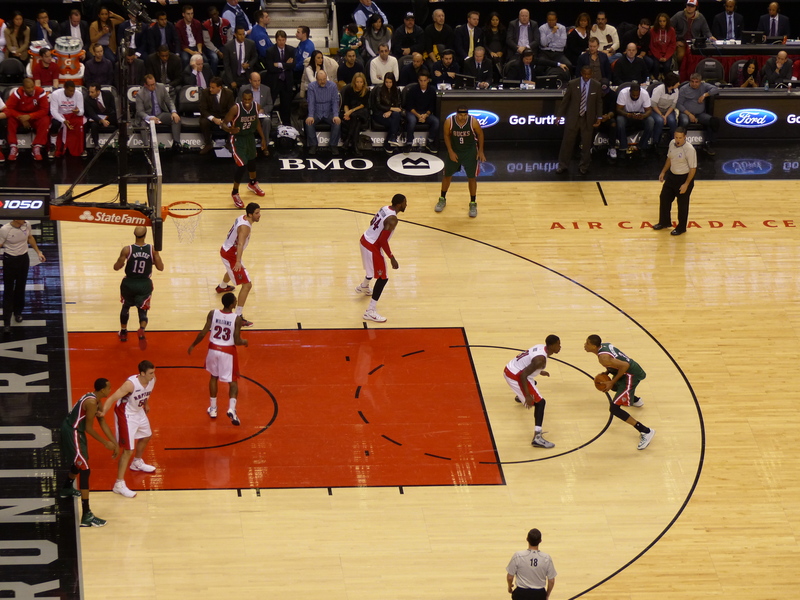 So, needing to crack on with all this sporting action, we started off with some basketball and booked ourselves tickets to see the Toronto Raptors take on the Milwaukee Bucks at the Air Canada Centre. Looking at the Raptors’ website, at first it looked like there was plenty of availability for tickets. But, with the website being run by Ticketmaster, they had deployed their usual trick of making availability look greater than it actually is. So in the end we found the cheapest tickets we could – with an unobstructed view and seats – on Stubhub. Despite ending up only two rows from the back of the arena, our view of the court was excellent (until the idiot in front of us started jumping around with her stupid oversized hat). The game started and Milwaukee soon raced into a lead, which was something of a surprise given that they are distinctly average and to date Toronto has been one of the best teams in the NBA this season. 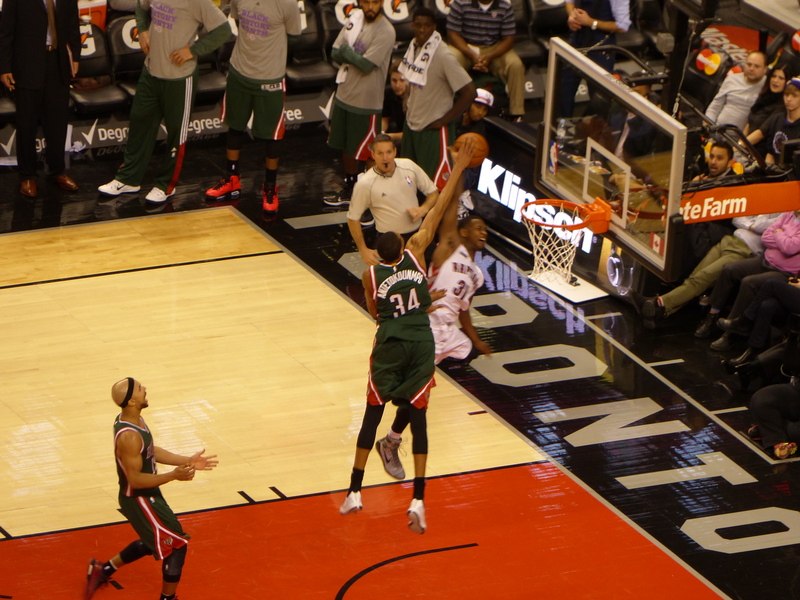 The game is divided into 4 quarters of 12 minutes, and for the first 3 quarters, Milwaukee were largely on top. Everything about their game was sharper whilst Toronto struggled to match their shooting accuracy. At this point, the crowd had been fairly quiet, with only the occasional chant of “Let’s go Raptors” when Toronto were on the attack, and “D-fence” when defending. The crowd only seemed to significantly perk up at the time-outs and breaks (of which there are a lot given this is an American sport), when the opportunity to catch a prize being thrown out or be seen dancing on the big screen caught the imagination. 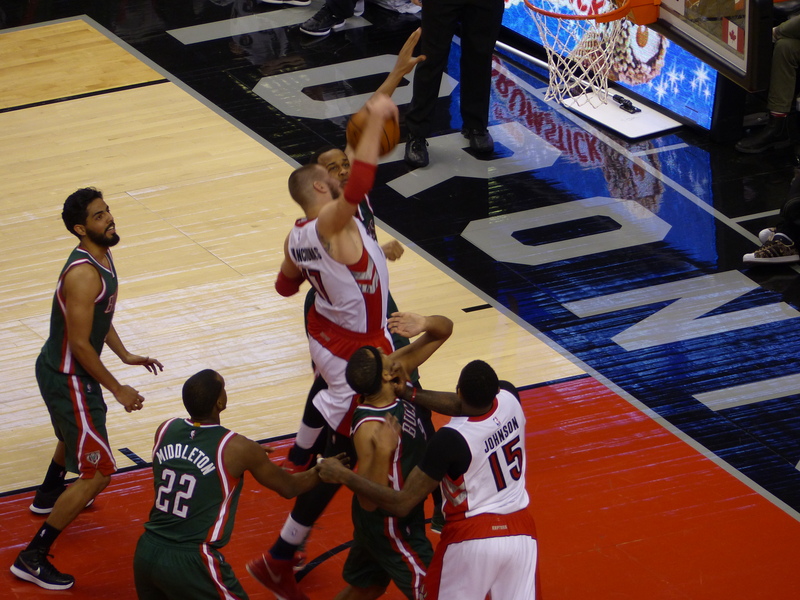 The Raptors 7ft Lithuanian star Jonas Valančiūnas reaches for the basket. Yes, 7 foot. 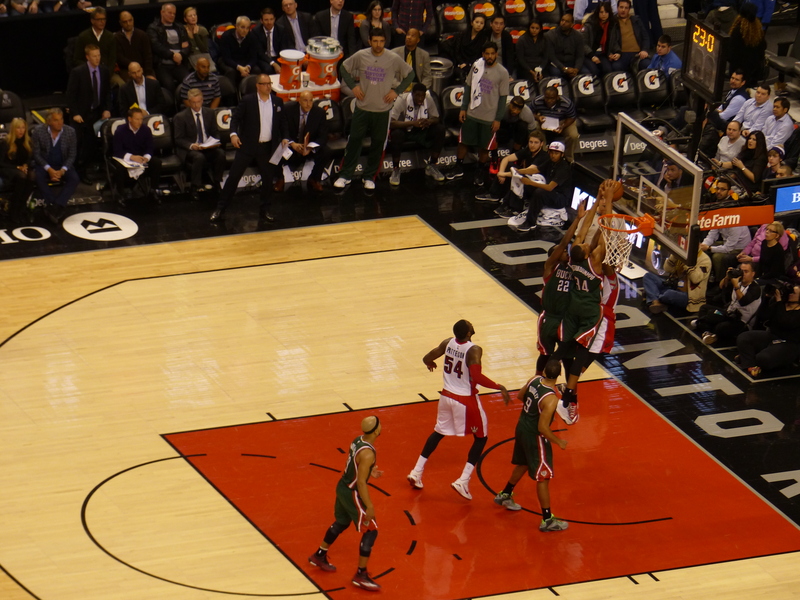 The 4th quarter got under way and Milwaukee soon extended their lead to 15 points. At this point Toronto started a fight back, and scored an impressive 15 points with no reply from Milwaukee to level the scores. Suddenly everything for Toronto was sticking and nothing was going right for Milwaukee, and you could see there being only one winner. 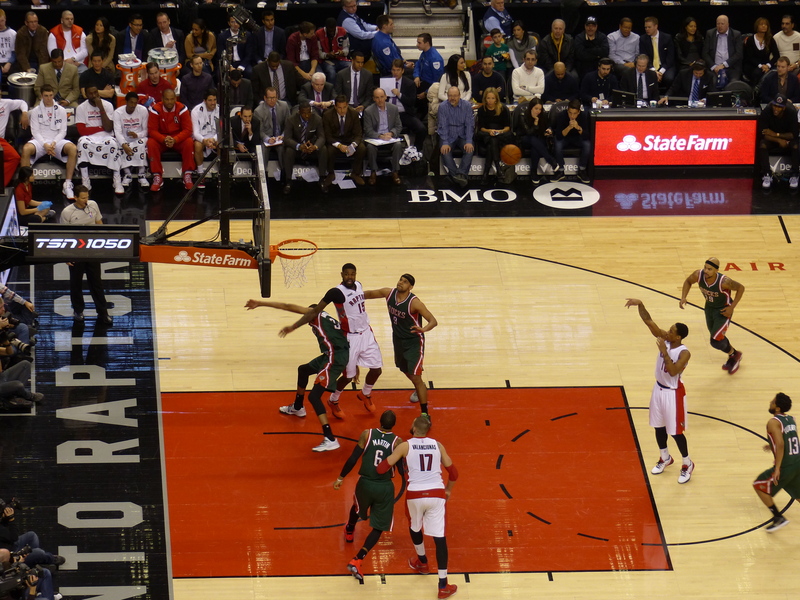 But this is sport, and after all that effort, the Raptors had run out of steam, and Milwaukee sealed the game with 7 final points. 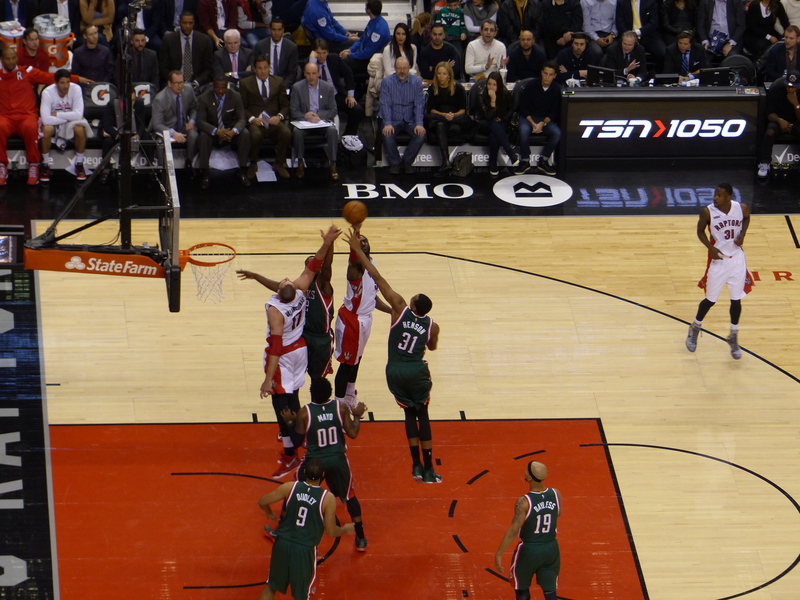 The final score was Toronto Raptors 75 – 83 Milwaukee Bucks. 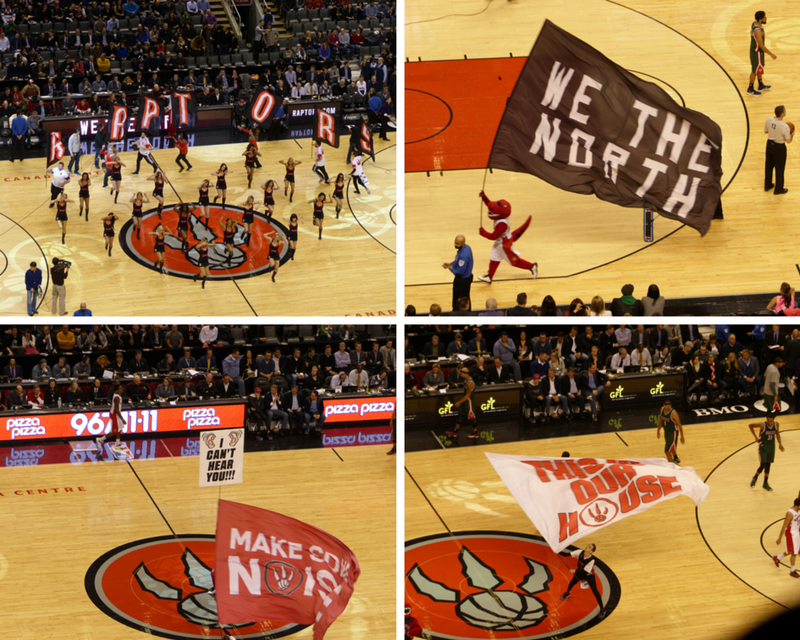 It was a really good evening out – a good game (unless you are a Raptors fan!) 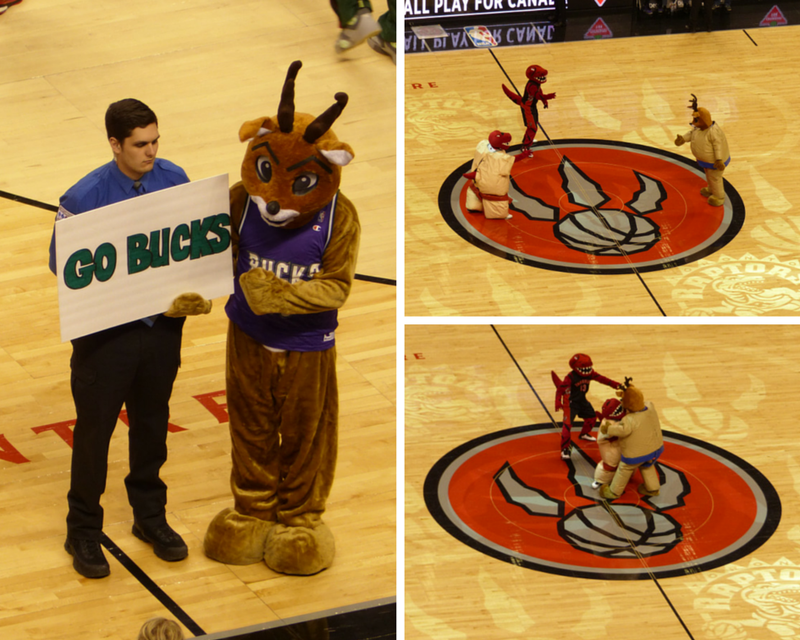 and some amusing entertainment during the breaks, such as the two teams’ mascots sumo wrestling! I’d definitely recommend it to any sports fans who are visiting Toronto.